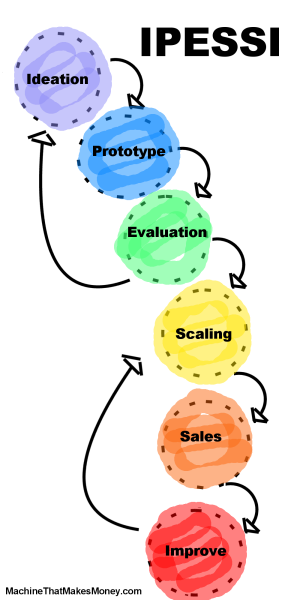 You do need a prototype – something you can show to people to gauge their interest and response. You prove the resonance of your idea. If you find that your idea has no resonance with customers, and tweaking is not helping, then it is time to move on to a new idea. Another way to say it is that you must demonstrate traction with your customers. You need to get a sense of the size of the market, and the amount of competition, you are facing. If the market size is small or the competition is too great, your idea may not be worth pursuing. You need to understand how much people are willing to pay for your idea, and this price needs to be high enough for you to make a profit. You need to develop your revenue model, as discussed here. It could be as simple as “I give you and bottle of water and you give me $1” (a normal product sales model), but it can also be more elaborate than that, as demonstrated here. You need to find a reproducible way to easily reach your customers . All of these different elements need to come together for you to have a viable idea that can move forward. In the P phase you do have to build some kind of prototype for your idea. Another common name is an MVP – a Minimum Viable Product. What does “minimum viable product” mean? It is a minimum set of features that demonstrates your idea in a way that would be valuable to a customer or an audience. That’s it. If you have that, you have the essence of Twitter. With that simple MVP, Donald Trump could post his tweets and people could see what he is saying. People could experience the idea, try out the idea, and find value in it. If you have these four features, you have the essence of YouTube. People can find real value in the idea with just these four features. Ray Kroc then took the prototype, which proved to be highly resonant, and started replicating it. Let me give you another example. There is a guy named Dave Ramsey. Whether you love him or hate him, there is no question that Dave Ramsey has built an impressive and very resonant empire which today has hundreds of employees. Dave is best known for his radio show (now #3 in the nation in audience size, with over 10 million daily listeners). His single-minded goal is to improve financial literacy and foster better financial behavior in the United States. His seminal book called The Total Money Makeover (first published in 2003) has been on the NYT best seller list for years, because his daily radio show (3 hours per day with millions in the audience) is a giant ad for the book. There is also “financial peace university”, with hundreds of sites across the country delivering in-person classes. Then there are web-based classes, live stadium events, podcasts, a huge catalog of “endorsed local providers”, the app, the web site, web tools (e.g. https://www.everydollar.com) and so on. It really is amazing to see all of the different pieces of this empire and to understand how they all interlink together. We could say that “the simple set of lessons and materials” was an early MVP. It was something he could give to people and gauge their response, their level of enthusiasm, etc. The feedback of his early audience let him tweak, improve and expand his material. Or we could say that the book Financial Peace – which was an expansion and crystallization of the lessons into book form – was an MVP because this book went out into the world and demonstrated a certain level of resonance that encouraged him to try a prototype radio show. The “selling out of the trunk of your car” thing is a common thread in entrepreneurship. According to the book Shoe Dog by Phil Knight, this is how Nike got its start. Phil sold shoes out of the trunk of his car at track meets. This is also how KFC got started. Colonel Sanders himself started by selling his proprietary cooking equipment and seasonings to mom-and-pop restaurants out of the trunk of his car (read the autobiography of Dave Thomas, founder of Wendy’s, for details). Grant Cardone talks about selling his first book door-to-door. Tatiana Birgisson, founder of Mati Energy in Durham, NC, is famous for schlepping cases of soda around in the back of her Yaris in the early days so she could get her energy drink into stores.